We are fast approaching the 10th anniversary of Open Design, which officially happens tomorrow (!!!). Today’s interview takes us into the editorial and development world of Amanda Hamon Kunz! Read on to learn more about her, her work, and her fun times with Wolfgang and the Kobold Minions below. Amanda Hamon Kunz was a developer for Deep Magic and Southlands and has been a contributor to other products in the Kobold Press line. It was a chance meeting that brought her to the attention of the kobold-in-chief and it’s been a fruitful association since. Q: Your day job is as a developer at Paizo Publishing, with whom Wolfgang has a long relationship as a contributor and business partner. What is the experience of working at Paizo like? What are your favorite parts of that job? The experience of working as a developer at Paizo is incredible on so many levels. At its very core, I go to work every day with some of my best friends, I get to have a creative stake in our game and in our world, and I get to guide freelance writers as they create gaming and canonical content for us. I can’t think of any job that could possibly be better. There are still moments where I can’t quite believe I’m working for Paizo on the Pathfinder RPG—it’s usually when I’m in a meeting trading ideas with other members of the creative staff, or developing text a senior staff member has written, or looking at the product page for a book that once lived only in my head, or just standing around chatting with my fellow developers about any of the many, many things we have in common. And, not only do I get to work with my friends, but many of those friends are some of the most important and influential figures in the game’s history. It’s just an incredible privilege. Q: You have a background in journalism. How have you found the transition from journalism to working professionally on adventure games? In many ways, the print journalism and tabletop gaming industries are quite different, but I’ve found that many of the core skills I gained in the former have served me very well in the latter. For instance, my years as a reporter and editor for a variety of newspapers accustomed me to daily, and often high-pressure, deadlines, and so I have a tight sense of how to help keep a tabletop product’s editorial functions on schedule. At different points in my past career I was a health, science, and government reporter, and so I often had to translate technical or scientific language into compelling news and features stories for a general audience. Those writing and communication skills now help me ensure that RPG rules language is tight and clear for players. Long-form journalism also often hinges on clear nonfiction storytelling, and in the tabletop industry, I take those basic skills and use them to put together fantastical stories about heroes, villains, might, and magic. Of course, everything I do now is far more creative and suited to my personality than anything I did in previous careers, but if I hadn’t learned many of these basic concepts and skills, I wouldn’t be nearly the RPG professional that I am today. Q: How did you connect with Wolfgang and Kobold Press? 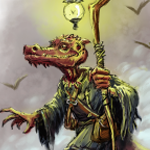 What was your entry point to become a minion kobold? My entry point into Kobold Press was so simple that it might almost be remarkable. At GenCon in 2012, I was chatting with Wes Schneider, Paizo’s editor-in-chief, at the Paizo booth, and Wolfgang happened to be nearby. Wes, who is an all-around wonderful guy (and who is now my manager at Paizo! ), introduced us, and we exchanged business cards. I was working for a Big Ten university at the time, and my title was “writer/editor.” Wolfgang mentioned that he needed editors for some upcoming projects; we connected via email shortly after the show, and everything went from there. I’m incredibly grateful to Wolfgang, not only because it’s simply great and awe-inspiring to work with him, but because the experience I gained working on projects for Kobold Press in the ensuing years prepared me for my job at Paizo. My career in the RPG industry right now would probably look very different if not for that chance meeting at GenCon, and if not for Wolfgang himself. Q: You’ve worked primarily as an editor on some of the big projects, including Southlands. What’s it like editing a big doorstop of a book? What is your work process? What do you look for as an editor? Is it all grammar, parallel sentence structure, and fixing misspellings, or are there game-specific things too? Not only did I edit Deep Magic and Southlands, but I was also lead developer for both books, too. Those are very big roles that both require a lot of work, but are also incredibly fun and rewarding. Because both books were 300-plus page hardcovers, they each had a long list of contributors, and therefore lots of moving parts. For Deep Magic, my development passes involved everything from converting some old 3.5 rules into Pathfinder versions, to macro-level rules and game content concerns, to micro-level stat block reviews. My editing passes involved making sure that we had appropriate connective text between sections and chapters, as well as checking spelling, grammar, punctuation, word usage, and everything else an editor handles. My work on Southlands was similar in scope, but because it was a campaign setting book, it was much more about helping the interconnected narratives and GM plot hooks be as flavorful, thematic, and immersive as possible. Both books had fantastic teams involved and I’m really proud of how each turned out. When you boil down my approach to these large projects, I’m really just asking the same basic questions in a variety of ways: How can I make this the best possible book for the intended audience, whether it’s players or GMs, and how can I make this text shine as brightly as possible? The various answers determine where I go from there. Q: You lived in Indianapolis? Were you a regular at GenCon? If you are a GenCon regular, what are some of your memories of past conventions? I did briefly live in Indianapolis while I was working at that city’s newspaper, and then for five years afterward, I lived about an hour from Indianapolis, so GenCon was practically a local con. But even before that, I was a GenCon regular. My first year at GenCon was 2006, and so last year marked my tenth straight year at the show! Early on, I made the trek as a college student from Eastern Michigan with my now-husband and our friends. I still remember how unbelievable it was to me that my favorite game designers and fantasy authors were so accessible and friendly to fans at the show. It was surreal to not only meet the folks whose names adorned my favorite products, but to talk with them and see that they were just as passionate about creating as I was about reading and playing. As much as I remember, as a young tabletop gamer, feeling like I had finally found a game seemingly made just for me, I remember feeling like I had found the perfect gathering place for gamers at my first few GenCons. And even though GenCon has grown exponentially and my place in the business has gone from fan to freelancer to full-time industry professional, I still feel the same way. To me, GenCon just always felt like home. Q: As a Midwestern myself, I have to ask, is there such a thing as a Midwest gaming aesthetic? A flavor that is Midwestern in style? Or is the gaming experience universal? I think one of gaming’s real strengths is that, although the rules and traditions might vary from system to system or group to group, it does offer a universal experience. Gaming is about gathering with friends—whether they’re lifelong friends, relatively new friends, or just friendly folks with shared interests—telling stories, playing heroes (or antiheroes! ), and having a great time. It’s about creating groups in which everyone feels welcome, important, and represented in the tales being told, and about using those stories to better understand yourself and the world around you. Gaming is for anyone and everyone, and that’s why I love it and want to spread the hobby as far and wide as possible. Q: Do you GM or play? What is your style and preferences in setting and character? Share your war stories, please! I absolutely play and GM! As a GM, I tend to favor florid descriptions, props, sound sets, and anything that helps immerse the players in the experience and convey the story implications of what’s happening. I like to riff off of improv techniques, which is to, whenever possible, respond to players’ questions with, “Yes, and…”, as long as it’s reasonably doable within the rules. Put another way, I try to strike a balance between running scripted or prepared adventures and letting the players shape their own stories. For example, a few years ago I was running a game at GenCon for some friends whose PCs found themselves facing several waves of orcs. They had fought a couple of battles and had taken some pretty bad injuries, and the cleric was out of channels. There were two more groups of orcs between the PCs and the forest to which they planned to escape, and the story I had planned involved the party being captured. Suddenly, however, two of the players (my husband and his cousin) decided that they were going to convince these battle-hungry beasts that they weren’t worth trifling with, despite being injured. Since they figured that orcs respond best to intimidation, my husband’s human barbarian made some gruesome trophies out of the orcs they had already taken down, and his cousin’s halfling rogue hopped on the barbarian’s shoulders, and they plowed toward the forest together, waving the trophies and screaming about the terrible fates that come to their foes. It was pretty hilarious and ended up garnering a few spectators around the table. What made it even better is that, when I called for Intimidate checks, they both rolled natural 20s. So, even though the party was never really supposed to defeat all the orcs, I figured that they deserved to make it to that forest. I adjusted the story on the fly accordingly and everyone had a great time. On the flip side, I really like to play characters that have distinctive backgrounds and unique personalities that fit their character classes, so that none of my characters ever feel interchangeable. For example, I have a half-elven bloodrager in the Paizo developers’ game that James Jacobs runs. She was raised in the elven homeland nation and had lots of forest-animal pets growing up, and so when she was hit with a confusion spell in a dungeon storage room, naturally the taxidermy squirrel on the shelf next to her reminded her of her old pet named Stewart. Even after the spell wore off, she decided to bring the squirrel with her as a souvenir and a little reminder of home, and Stewart has now become the party’s unofficial mascot. My fellow developer, Linda Zayas-Palmer, even made me a little Stewart prop, which I use on game day to mark off the monsters we’ve faced. It’s great fun, and certainly makes the character memorable. Q: Like a catcher at a baseball game who sees the entire field of play, an editor sometimes has a better grasp on the entirety of a project than anyone who worked in detail on a specific section. Do you find that to be true and how does that inform the editing? I do think that’s true. Most large projects have a lot of writers involved, and those writers can’t know how their colleagues’ turnovers will look because everyone is working simultaneously. Outlines can help, but you always have variation when you’re handling a big book. That’s why I’ve found that it’s important to be able to review all of the turnovers as a whole, paying particular attention to sections that reference or interface with each other, before really getting into the nitty-gritty of editing and developing. Q: What KP products are your favorites and why? Great question! I really love the Midgard Tales hardcover, because it offers 13 adventures all set very organically in flavorful locations on Midgard. 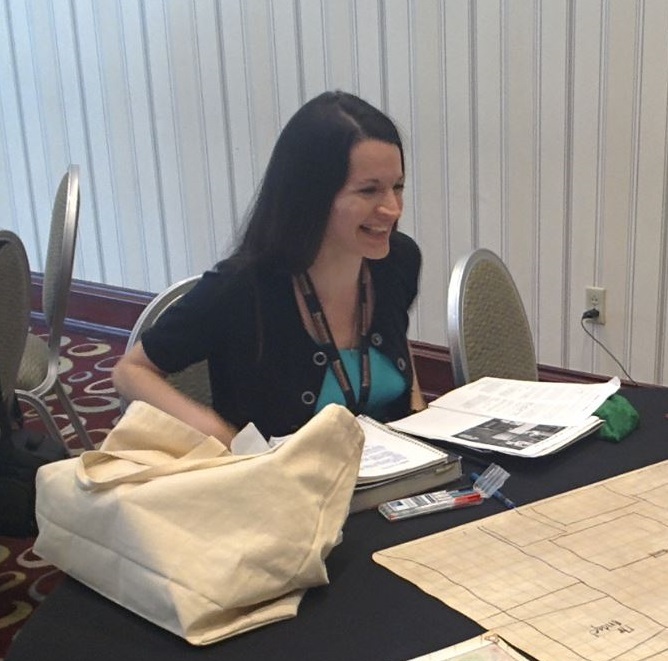 I’ve run several of those adventures at various cons and at home, and it’s really fun to watch players react to some of the fantastic lore those adventures bring to life. Of course, the Midgard Campaign Setting is ground zero for that world and is also one of my favorites, as is Southlands, which has enough awesome high-fantasy and mythologically tinged influences to fuel several years’ worth of campaigns. For their sheer number of creatively crunchy options, Deep Magic and the Advanced Races Compendium are up there, too. Q: Everything about editing is collaborative. 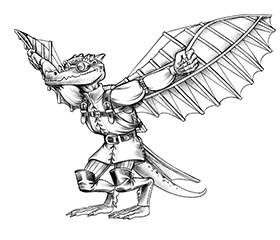 Who are some of the Kobold minions you’ve worked closely with and what do you see as their strengths in producing products? One of the fantastic things about Kobold Press is that it’s a very tight operation, everyone tends to work really well together, and it’s all tied together by the fact that we all love and are personally invested in what we’re creating. Marc Radle, for instance, is a great art director and graphic designer, and has gracefully responded to more than a few “HOLD THE PRESSES!” emails that have hit him very late in a production cycle, when we realize that we need to fix something before going to press. Ben McFarland is a great designer who can handle any deadline thrown at him and is great to brainstorm with, as is Brian Suskind; both of those guys were co-writers on Southlands and were just great to work with during the entire process. Essentially, every Kobold minion I’ve worked with has been affable, enthusiastic, and professional, and I’ve been honored to work with all of them. And, of course, there’s Wolfgang, who is truly the glue who holds us all together. Q: To conclude each interview, I’m asking each person to think about something fantastic or wonderful or scary from all the KP products that would make an awesome gift for Wolfgang. Basically, let’s fill up Wolfgang’s garage with weird and wonderful stuff. What gift would you choose and why? The first thing that pops to mind is the Bottled City, created by none other than Zeb Cook for the Southlands core book. The Bottled City looks like just a dusty old wine glass, but for those who know the password, its powerful magic can shrink speakers down to size and transport them into the world within. Inside the bottle is an entire city of thieves, assassins, and fantastic wonders, including a market with every bit of magic you never knew existed. After all, Wolf is the Kobold King, and every king needs his own city! You are awesome Amanda! It is always a great pleasure to work with you on any project! Amanda is a charming person. No wonder people love working with her.